What is the difference between Lite and Pro? Wezarp technology is composed of a set of libraries for dedicated Integrated Development Environments (LabVIEW with Wezarp for LabVIEW, or C#, C++, Visual Basic.NET, JAVA, ANSI C, LabWindows™/CVI, WINDEV with Wezarp Library) and free client applications for tablets, smartphones or remote desktops. It proposes an easy remote solution to control or monitor a remote software application or a Windows remote desktop. Wezarp is multi-client, multi-server and multi-window with no limitation of the graphical user interface design. 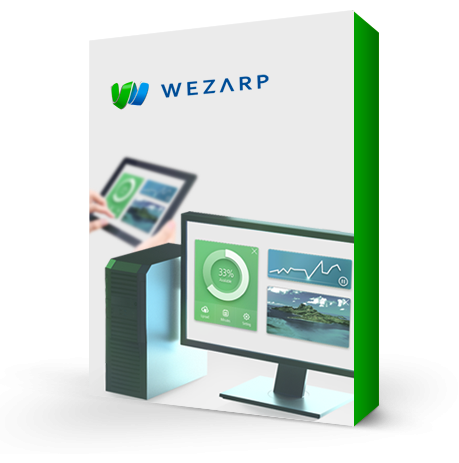 Simply insert Wezarp Server library into your program, Install Wezarp client software on your remote device, set the server IP address. That's all, it works! Wezarp is not yet another remote desktop software solution over internet. It works within your network domain and applies your safety rules.